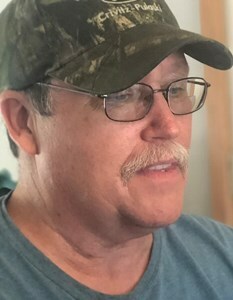 Victor "Gene" Sperberg, 63, of Suring, beloved husband of Joy (Johansen) Sperberg, departed this life unexpectedly at Thedacare Regional Medical Center in Appleton surrounded by his family. Gene was born on February 11, 1956 in Oconto Falls, WI son of the late Victor and Delia (Marsh) Sperberg. He retired after ten years of service from Goodwill Industries. In his spare time he enjoyed camping, playing the guitar, taking annual trips to Mackinaw City, and spending time with his family. Gene is survived by his wife of 42 years, Joy; two daughters Becky Sperberg of Gillett and Amber Sperberg of Green Bay; two grandsons Aaron "AJ" Teson and Bryce Teson; a brother Roman (Nancy) Sperberg of Suring; three sisters: Terry Flick, Marsha (Al) Johnson, and Penny (Dalt) Heimerman all of Suring; many nieces and nephews; three sister in laws: Naomi (Dave) Stemper, Jill Schmitzer, both of White Lake, WI, and Nancy Johansen of Appleton. Victor was preceded in death by two infant sons Victor and Bryce, three brothers: Jack, Ronnie, and Dickie; a sister Yvonne; brother-in-law Kurt Johansen. At the request of Victor, there are no funeral services but a Celebration of Life will be planned at a later date. Add your memories to the guest book of Victor Sperberg. Deepest condolences to the family. So sorry for your loss. Sincerely Mike & June Schultz. When living in Iowa with us he was in his teens. Working with my dad. He and I went to the Dairy Queen then a movie. When we come out it was raining really bad we stood there watching garbage cans floating down the road. We look at each other and cracked up laughing. We never seen anything like it before. Walked home in pouring rain. The only thing that bother him was it ruined his cigarettes. Lol. Love you Gene. Gene you will be missed. We had some good, crazy and wild times growing up. You were the brother I never had. You taught me alot, mechanics, music and living life to the fullest. Hate to have lost you but you will be forever in my heart. Rest in peace my friend. We will meet up again. Loved camping and rummage sale shopping with Gene and the rest of the family. You will be greatly missed Gene. RIP my friend.